For his debut feature film, writer/director Shawn Ku has a film that packs a punch. 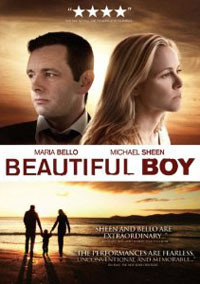 2010 movie Beautiful Boy (Anchor Bay; Blu-ray $29.99, DVD $$26.98; released Oct. 11, 2011), starring Maria Bello (Grown Ups) and Michael Sheen (Frost/Nixon), tells tje hard-hitting story of an unhappily married couple (Bello and Sheen) on the verge of separation. Their already-strained marriage is tested when they learn that their 18-year-old son committed a mass shooting at his college and then took his own life. The life-altering tragedy forces the couple to face their own feelings of guilt, rage and blame as they attempt to absorb the event and slowly put their private and public lives back together. Ku spoke to Disc Dish about the film’s production. Disc Dish: I can’t imagine it was easy to get a tough drama like Beautiful Boy financed and off the ground! 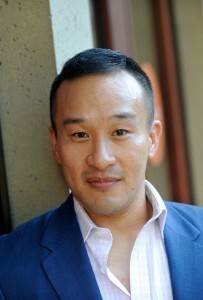 Shawn Ku: No, it wasn’t the easiest sell, but the idea is one of those things that people are struck by. We had a producer who really stuck by it for a while, but he just couldn’t make it happen. Then we had [producer] Lee Clay, who was really committed to it and who really got it going. It’s always hard to make a movie like Beautiful Boy and we knew that if we wanted to move ahead with this one, we had to make it on a dime. DD: Snagging Michael Sheen and Maria Bello to star couldn’t have hurt. Michael Sheen and Maria Bello's strained marriage is put to the ultimate test in Beautiful Boy. SK: Michael was working like crazy then, as was Maria. But they wanted to be involved and they shoehorned the time period in. Of course, they were a big part in getting the financing to come through. When you’re getting everything lined up, you inch your way down the same double helix path — casting and finance — and hope they end at the same time. DD: And how long was principal photography? SK: We had an 18-day shoot in downtown Los Angeles. Our cast and crew worked for nothing. SK: There’s a lot of pressure when you’re working under a tight schedule like that. And we had no pick-ups or reshoots planned. We had to build them into the production. It was challenging. DD: The heat is on. SK: Somebody told me once that directing is like getting pecked to death by crows — everyone needs a piece of you, time-wise or mentally. They’re right. DD: Michael and Maria appear to have risen to the occasion. SK: For them, emotionally, it must have been pretty tumultuous. There wasn’t a single day without a heavy scene. But they’re both pros, and we had a really, really smooth shoot. DD: I always think about how an actor has to carefully modulate his performance in a tough drama or tragedy when nuance and degrees of intensity are so important. SK: Oh yes. It’s the actors who are bringing life to it. They’re rounding out all the features of the character and adding in the shades. DD: The art of acting. SK: It’s really interesting, because when you’re writing a screenplay, it’s coming out of you chronologically. But when you’re shooting it, it’s in a different order. When a character is on paper, it’s only two-dimensional and you’re only visualizing it. There was one particular time when we were doing a scene with Maria and as the writer, I wasn’t thinking about it on the same level as she was. I had it in mind as a single scene, but Maria, as an actor, had placed it in the context of the overall story. She took into account what had happened before and what was going to happen later on. We tried it different ways and her way was the best.